Hatfield House Tennis Club once again hosted the Billy Ross-Skinner British Mixed Doubles Championship, sponsored by Neptune Investment Management, over the weekend of the 3rd, 4th and 5th February. The tournament consists of the 16 best ladies available, partnered by 16 men of a suitable standard, to give each pair an even chance of winning the title with a repêchage system to give first round losers a second chance. The leading ladies competing included current World No 2 Sarah Vigrass, World No 3 Karen Hird and World No 4 Freddie Adam. The Winners were John Evans (Holyport) and Elvira Campione (RTC) who beat Karen Hird (RTC) and Roger Thompson (Seacourt) 6/3 6/2 in a hard fought final in what was the first attempt for either player in the event. The first day saw a number of home players involved to varying degrees of success. 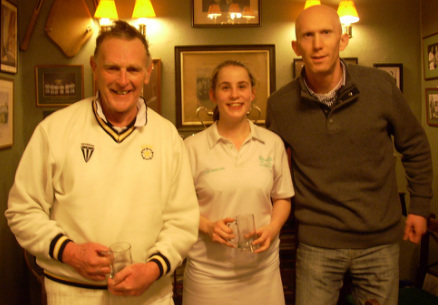 Hatfield Club Captain Nick Brodie and his partner Alex Garside (Seacourt) and Jonathan Fisher and his partner Ellie Harris (Oxford) both made it through to the Quarter-Finals. While Louise Mercier and her partner Andrew Mountain (Manchester) and Steve Brewerton and his partner Sara Reston (Fontainbleau) unfortunately failed to progress. 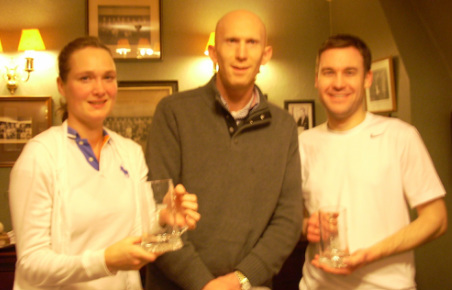 The other pairs to make it through were Ladies World No.2 Sarah Vigrass (Prested) and her partner Chris Davies (Queens) and 2 time winner Anthony Clake with his partner Lucinda Pigott (Bristol & Bath). There were some incredibly close matches throughout day one, none closer than either the first match of the day, where Vigrass and Davies narrowly overcame Reston & Brewerton 6/5 3/6 6/3 or indeed the final match of the day which saw a brutal exchange between Pigott & Clake and Helen-Frances Pilkington (RTC) and Nick Jones (Seacourt) which finally ended 6/4 5/6 6/3. Day two was set to continue along the same lines as day one, with some very close matches and some superb tennis all-round. Current Ladies World No. 3 Karen Hird and her partner Roger Thompson were the first to proceed by beating Catherine Walker (Hatfield) and her partner, last year’s winner Johnny Beale (Bristol & Bath) 3/6 6/2 6/5. Walker and Beale did manage to progress themselves though later in the day, with a slightly more straightforward 6/1 6/1 victory over Beale’s victorious partner from last year Sara Metherell (Queens) and Marek Stefanowicz (Queens). The other players to progress from day two were Elvira Campione and John Evans and Dom Wright (Queens) and Jess Garside (Seacourt) who at only 16 years of age was one of the youngest competitor to have ever taken part in the event. Jess more than held up her end of things during her group matches, as she and Dom looked the most assured of all the pairs during the group stage and were the only pair not to have dropped a set up to the Quarter-Finals. She was very solid in defence at the galleries and hit the ball incredibly hard for someone of her age and stature and together with Lucinda Pigott, shows that there is a very promising future for ladies tennis in this country. Sunday got off to the worst possible start when the competitors got up to be greeted by the aftermath of a night of heavy snow. Sadly there was a delayed start to proceedings due to the weather but all players made it to the Club and a full day’s play was had. Special thanks to Ellie Harris, who made a great effort to make it over from Oxford in horrendous conditions, sadly only to come unstuck in the cruellest of fashions, losing 6/3 2/6 6/5 to Walker & Beale. Brodie and Garside, who had looked so assured on day one, never quite recaptured that form as they lost 4/6 2/6 to Campione and Evans, who were beginning to gel well together as a pair. Elvira has a superb double-handed volley on both sides which caused many opponents problems throughout the event and John Evans was getting more and more consistent the longer he was on court. Karen Hird and Roger Thompson won through 4/6 6/0 6/5 in a topsy-turvy match against Vigrass & Davies. The final Quarter-Final saw Clake and Pigott beat Wright and Garside 6/5 3/6 6/5 in the closest match of the round. It was impossible to pick a winner throughout but Anthony was able to raise his game just enough at the crucial time to see them progress to the Semi-Finals. The first Semi-Final was a fantastic battle which went right to the wire with John Evans and Elvira Campione finally overcoming Catherine Walker and Johnny Beale 6/4 2/6 6/5 to arrange the meeting with Karen Hird and Roger Thompson who amazingly also won 6/4 2/6 6/5 in a titanic battle over Lucinda Pigott and Anthony Clake. Both Semi-Finals showed exactly what this tournament is all about, with superb rallies, brilliant retrieving and brave and determined volleying at the net. That just left the final which was much closer than the score suggests but Evans and Campione were deserved winners. 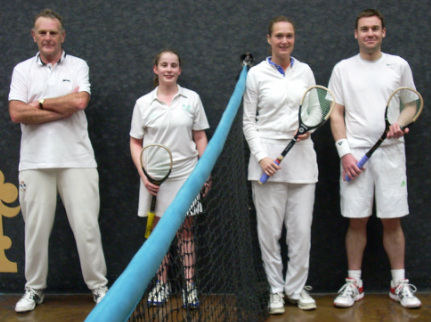 Perhaps the fact the combined age of the other 3 players was almost equal to that of Roger Thompson played a part but he held his end up very well and with Karen sprinting around at the back of the court they never gave up but couldn’t overcome the ever growing confidence of the other pair. Huge thanks to Viv Dawes for all her organisation again this year. Once again the pairings led to some very close matches and superb tennis throughout. Thanks also to Ros Hedges, Liz Fisher and Sarah Sullivan for the superb food laid on throughout the event and to Liz again for organising accommodation at the last minute for those who required it on the Saturday night. Finally thanks to the markers for their efforts during the event in spite of the cold.